It’s not often that I get the opportunity to head to Duluth for a meal. Typically, after my 400 mile drive east, Jennifer will say the drive from Buckhead to Duluth is simply too far and too taxing. The result is many of Atlanta’s Korean and Chinese restaurants slip out of my grasp. However, after driving back from Charleston, Jennifer acquiesced to a long distance dinner, but the question was where to go? In what has become a running joke, I first suggested Honey Pig, but I decided something else was in order. 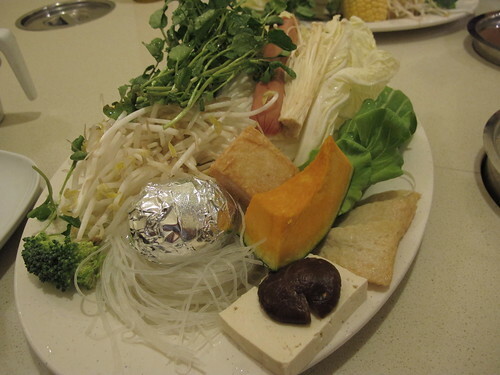 Remembering a review from Chloe Morris of Chow Down Atlanta , I suggested that we give Korean hot pot a go. Sacrificing her time and comfort, Jennifer agreed and we began the drive to Pleasant Hill Road in Duluth. Sadly, even with Morris’ review, I wasn’t quite sure what to expect when we pulled into Shabu & Shabu. 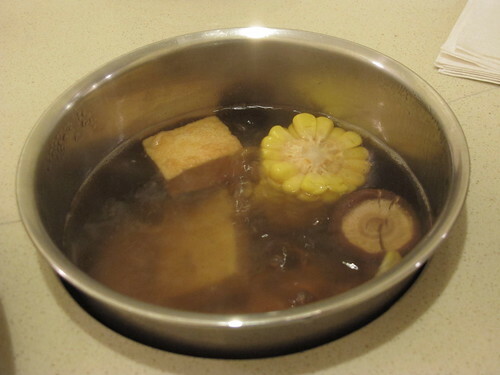 Prior to this meal, my sole experience with Korean hot pot came from a recipe for sogogi shabu shabu from Crazy Korean Cooking; fiery red and potent, that shabu shabu was a distinct departure from the usual Japanese style. 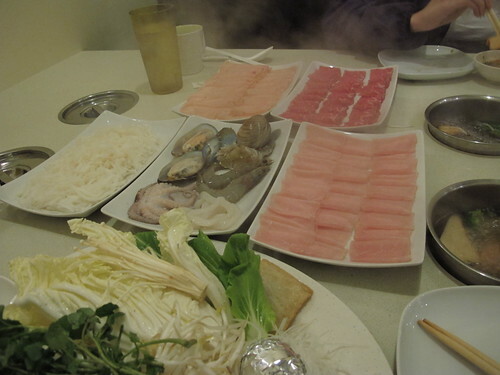 Regardless, on a chilly and rainy night like that Sunday, any type of hot pot was welcome. After we were shown to a booth with a privacy curtain, it was soon a matter of where to begin. Even with individual pots of broth, we decided to try a little bit of everything and that started with a plate of vegetables. There seemed to be a little bit of everything here, tofu, rehydrated shiitake mushroom, egg, enoki mushroom, kabocha squash, fish cake, corn, bean sprouts, etc, but what really confused us was the addition of a hot dog. Nestled between the enoki mushroom and the greens was a half of a hot dog. 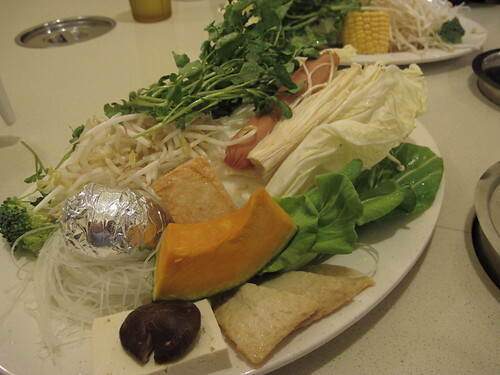 Maybe Shabu & Shabu decided the vegetable plate needed a little emulsified meat, your guess is as good as mine. Healthy bits and hot dogs aside, it was a little bit of everything when it came to the meats. Pork, chicken, beef, seafood, and even an extra plate of tripe, it was far too much for two people but we were feeling ambitious. 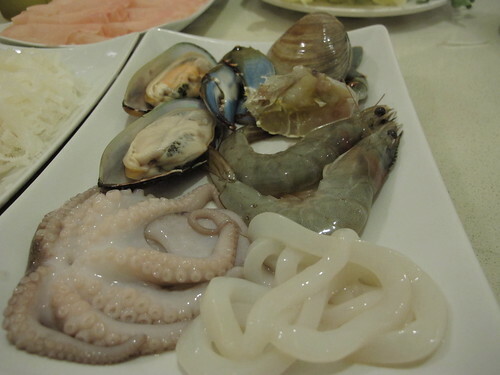 The seafood was a particular standout and as soon as it arrived I was trying to think of an elegant way to eat the whole baby octopus. When it actually came to cooking our proteins and vegetables, we were each armed with a small pot of broth. I’m guessing it was some combination of dashi and mirin, regardless it was well suited to everything on the table. One thing Chloe had been particular about was the sauce and at Shabu & Shabu, they will tailor the dipping sauce to your heat tolerance. 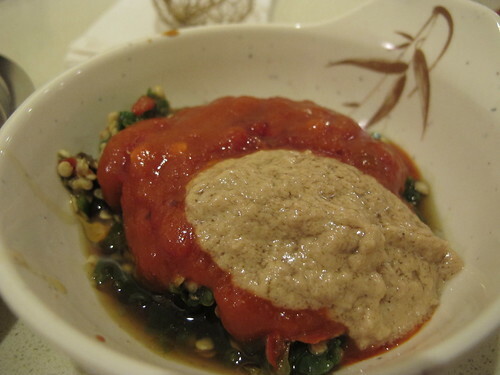 This medium sauce it was pleasant combination of ponzu, sesame sauce, chili sauce, and scallions. 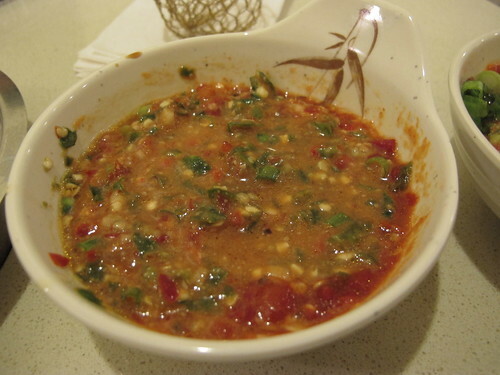 Our waiter didn’t believe me when I asked for the extra hot sauce, but they soon brought me a bowl brimming with diced Thai hot peppers. After a quick mix I was ready to start cooking. When the picking, swishing, dipping, and slurping was finished, there was still plenty of tripe and a few vegetables left. Nothing against the tripe, but when I’m made to choose between meat, hand pulled noodles, or tripe, the third choice looses every time. While the empty plates can attest to the quality, if there is one downside to Shabu & Shabu, it’s the location. Were they closer to Buckhead, I would insist on a visit every time I made it to Atlanta. However, even with the drive to Duluth, the service, the food, and that nasal clearing extra hot dipping sauce makes it all worthwhile. It was Sunday morning in Las Vegas and though I was still recovering from a pool cabana bar tab and a lackluster dinner at Carnevino, I was bound and determined to see my friend Michael before my flight back east. Of course, there are few better ways to catch up with an old friend than over a fine meal, but I was still unsure about where this meal would take place. Tempted by the idea of all things Keller, I had suggested Bouchon Bistro for brunch, but, as if by instinct, I cancelled that idea and decided it was dim sum or nothing. I suppose the family habit of seeking out dim sum when it is available is as strong as ever; that aside, it was still a matter of where to go. Despite being a newly minted Vegas homeowner, Michael wasn’t up to date on the latest and greatest in Las Vegas dim sum. In fact, aside from a meal at Ping Pang Pong three years ago, he had only enjoyed the Chinese tradition once. 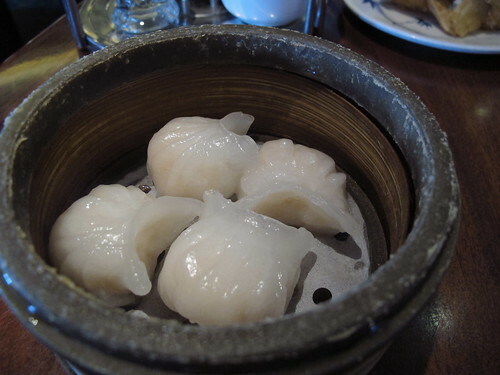 However, that one time, had been at a restaurant named Orchids Garden and was, in his opinion, a fine meal so after picking me up from the hotel, we were off to Orchids Garden for the first wave of Sunday dim sum. Arriving just as the restaurant opened, the carts seemed to trickle out of the kitchen, but it wasn’t long before out table was full of plates and steamer baskets. 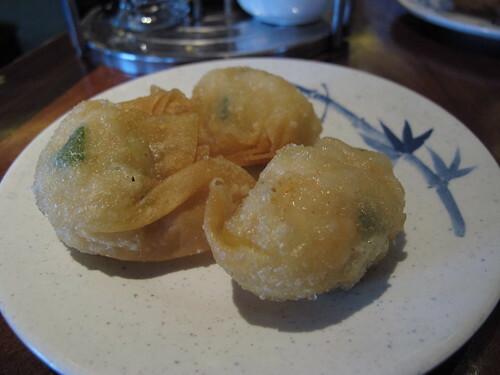 One of the first plates was an order of shrimp dumplings. 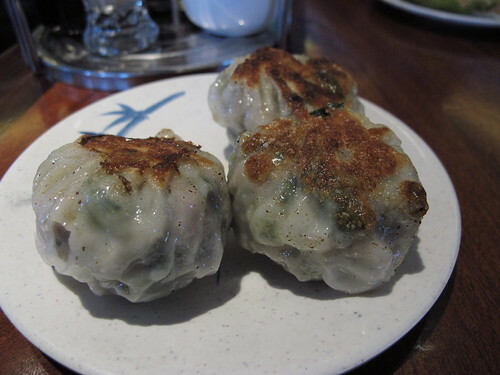 Still crisp from the fryer and not too greasy, these dumplings had a big and juicy shrimp filling. 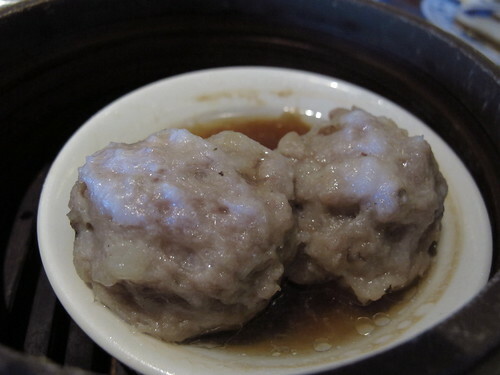 They say you can judge a restaurant by its har gow. In that case, Orchids Garden may very well receive a failing grade. 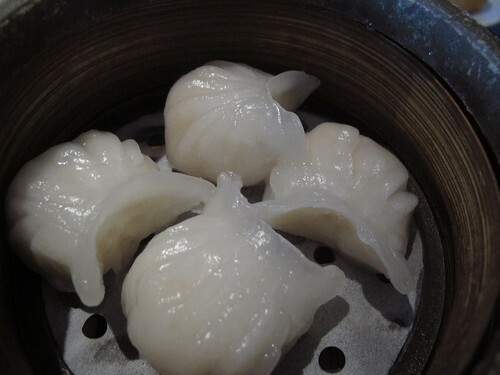 From the thick, doughy, and hardly translucent wrapper to the meager shrimp filling, there weren’t many redeeming qualities to these har gow. While each bite of these dumplings was a mouthful of wrapper, the shrimp that were present were decently briny even if they were missing the usual crunch of bamboo shoots. Most dim sum outings, I’ll skip the sugar cane and shrimp paste, but I decided to indulge at Orchids Garden. 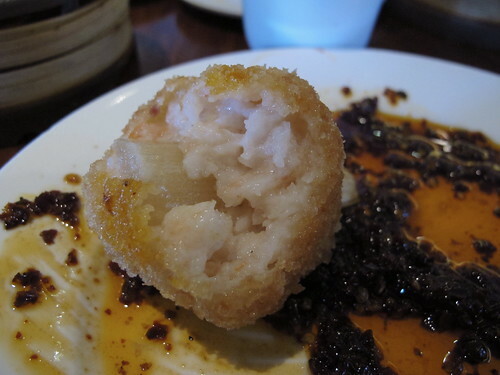 As you might expect, this shrimp paste had a tinge of sweetness. When combined with a well-cooked exterior and the natural flavor of shrimp, the sugar cane was a fine choice. 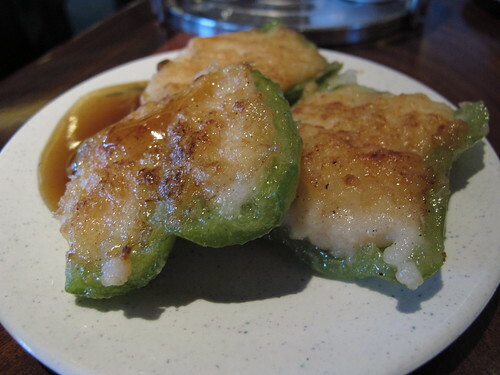 A constant component of any dim sum meal, the bell pepper shrimp were a welcome addition. Far too often, I’ll find pepper shrimp that have been on the cart for too long with cold shrimp and limp peppers to show for it. These pepper shrimp were quite the opposite. A crispy snap of bell pepper, the crunch of seared shrimp paste, and a sweet sauce made for a satisfying example of the dish. 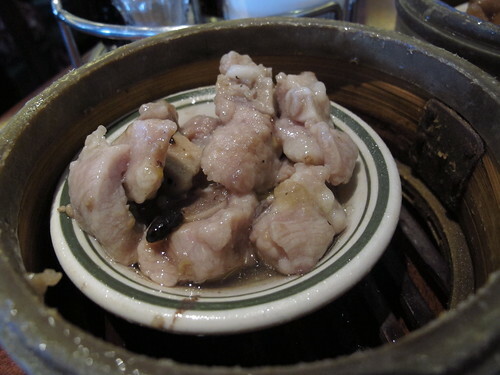 Often labeled as seen juk guen, Orchids Garden calls the next dish bean curd skin rolls. Always on the messy side, this bean curd skin rolls are almost always worth the effort but Orchids Garden prepared theirs a little differently. Instead of the usual mélange of pork, shrimp, and vegetables, this roll was completely filled with pork, large chunks of juicy, silky, and incredibly meaty pork. 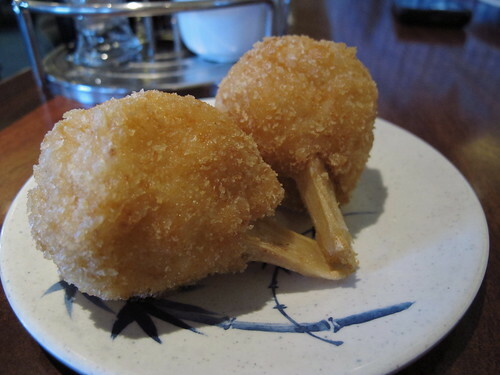 There’s not much more than meets the eye with Orchids Garden’s pork balls. Little more than two massive pork meatballs in a black mushroom broth, this dish showed just how well pork and mushrooms work together. Usually one of the first dumplings out of the kitchen, I was surprised it took the siu mai so long to arrive. If there’s one trend I noticed at Orchids Garden, it’s a propensity for big cuts of meat in every dish. 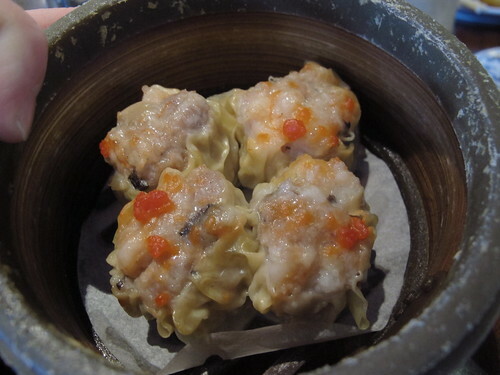 Instead of finely minced pork, these siu mai were filled with large, greasy yet savory cuts of pork and topped with a tiny bit of carrot for contrast. 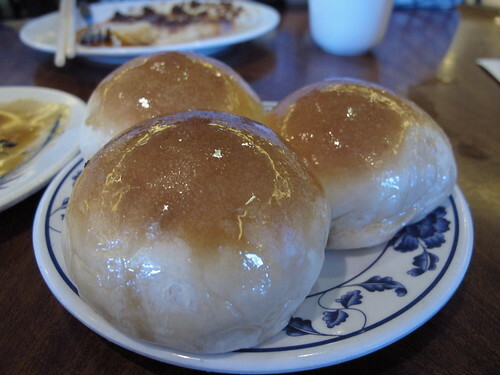 Typically, I steer clear of pork buns in a restaurant, not because I have anything against the combination of sweet dough and well-cooked char sui but because they are so filling but when Michael expressed an interest, it was one order for the table. Glistening in the light, these baked bbq pork buns were incredibly sticky so much so that they were held fast to my hand when held upside down. Inside the sugary wrapper was a filling that I can best describe as sweet custard mixed with char sui. As delightful as this pork bun was, maybe I should order them more often. 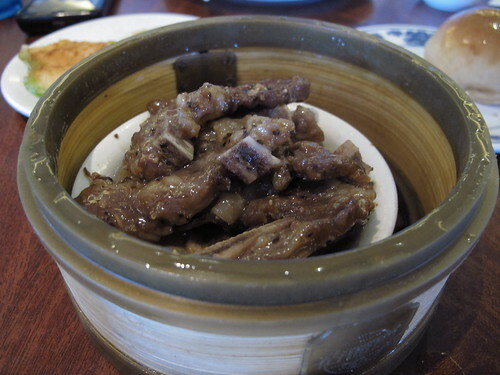 In the world of dim sum, beef is a relatively small player so I was surprised to see these short ribs on a cart. Greasy to the touch, it was sheer beef flavor that saved these short ribs. Of course, a healthy black pepper punctuation helped a bit. Once again a well-seared crust gave way to a filling of large, juicy pork pieces but this time each bite was riddled with the oniony bite of chives. Fung Jao, chicken feet, call it what you want, these appendages have a polarizing effect on people. Luckily, Michael is willing to try anything even an order of three giant chicken feet. 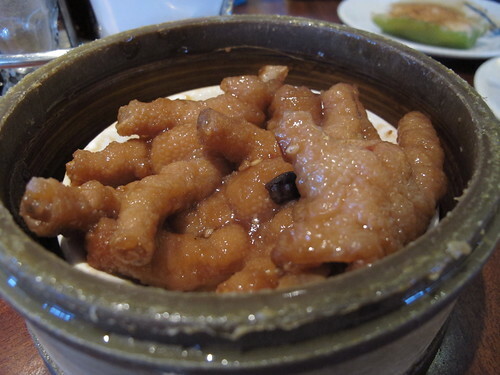 Almost too hot to heat, these chicken feet were sweet and gelatinous. I kept hoping to find a slice of chili pepper to tame the sweetness but no such luck. 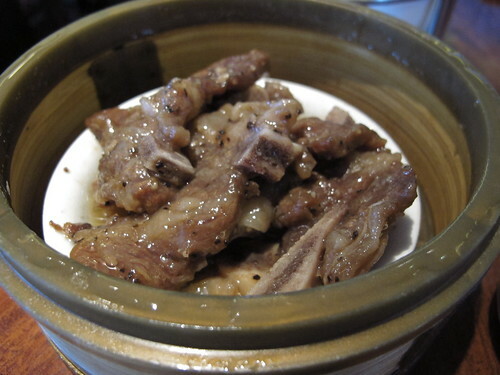 Hoping to end the meal on a more approachable note, the last dish was an order of steamed pork spareribs. More often than not, these spare ribs are more fat and bone than meat, but Orchid Garden once again errs on the side of meatiness. With plenty of meat to each rib, it was just a matter of enjoying the flavor of fermented black beans, pork, and the unusual addition of sweet potatoes. If there’s one glaring trend at Orchids Garden, it’s that finesse and moderation are not a priority. 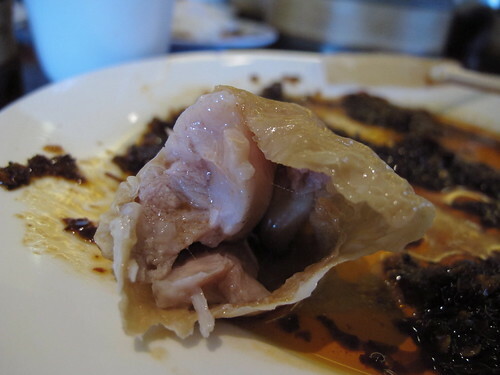 From the siu mai, to the bean curd skin rolls to the chicken feet, big and meaty cuts were the name of the game and for the most part, it worked. Oddly enough when it came to the typical dim sum litmus test, Orchids Garden failed spectacularly, but every other dish was satisfying if a bit too greasy. With the bill paid and hotel checkout looming, Michael and I both agreed that Orchids Garden offered a perfectly fine dim sum even if it does come across a bit ham handed at times. Allow me to paint the scenario. After a three year hiatus, I had once again touched down at McCarran International Airport and arrived in the grand city of Las Vegas. However this wasn't a casual visit to the pacific time zone, I was in town for the ever clichéd but near sacred rite of passage known as the bachelor party. Who else was attending this occasion? Months of planning and a flurry of last minute cancellations had trimmed the group to a svelte six members, all fraternity brothers. Interestingly, I had been charged with choosing a location for the grand Saturday night dinner. Almost immediately I looked to the Michelin guide and I was heartbroken to hear that both Joel Robuchon and the Atelier would be closed for renovations and summer holidays. Turning to the next best thing, I made reservations at 2 and 1 star establishments such as Picasso and Michael Mina as well as a few steakhouses. Waiting to the very last minute, I ultimately decided that Michelin star finery might be a bit much for a bachelor party. In the end, it was the allure of six to eight month dry aged reserva beef that made me choose Mario Batali and Joe Bastianich’s Carnevino for our grand dinner. After an alcohol fueled day at the pool, our motley group had showered, sobered up, and dressed for the occasion. 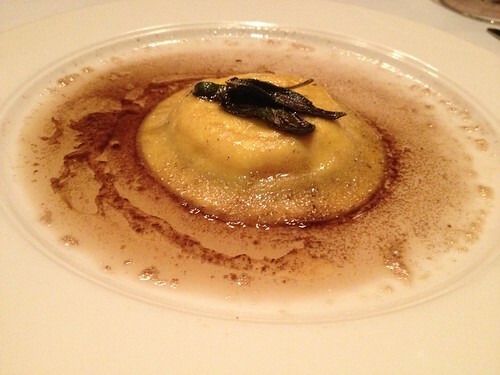 A short cab ride later, we made the trek through the Palazzo casino floor and arrived at the entrance to Carnevino. 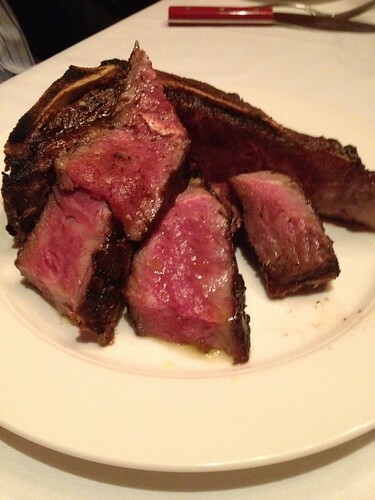 Once we were seated in our semiprivate, curtained room, it was time to get down to the business of steak. However, before any cut of beef would make an appearance, I decided that a pasta appetizer was in order. 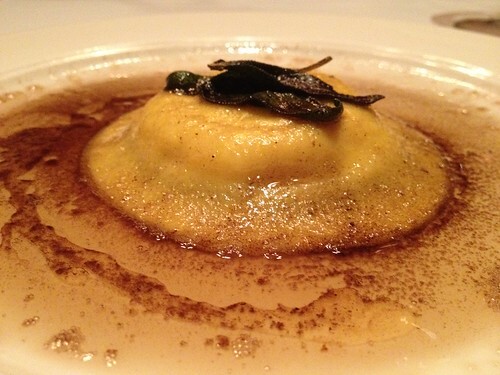 If there has been one recurring theme in every Carnevino review that I’ve read, it’s been that the food is rich and this ricotta and egg ravioli in brown butter was no exception. Topped with fried sage, this pasta was deep brown on the edges and nearly swimming in a staggering amount of nutty browned butter. From the first bite, I was looking for an acid to cut through the richness of butter and ricotta but then I came across the egg yolk. Some might say this three pronged attack of cheese, butter, and yolk was too much and they would be right, but it paled in comparison to what was next. 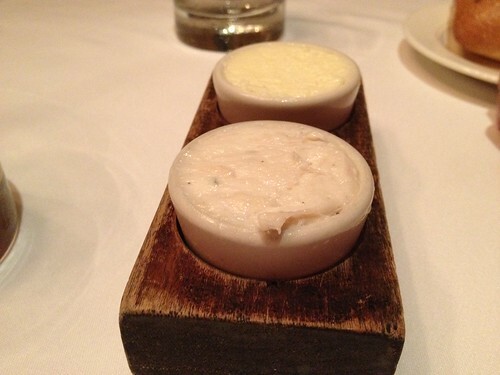 Typically the combination of bread and butter is the first thing on the table, but after an hour and three separate requests, the beginning of the meal arrived. 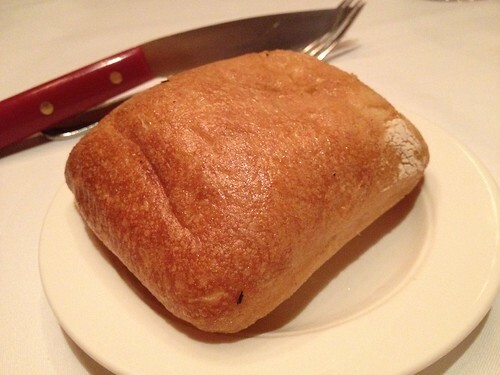 On one hand was a perfectly delightful dinner roll complete with a nicely developed flavor and a good crust. 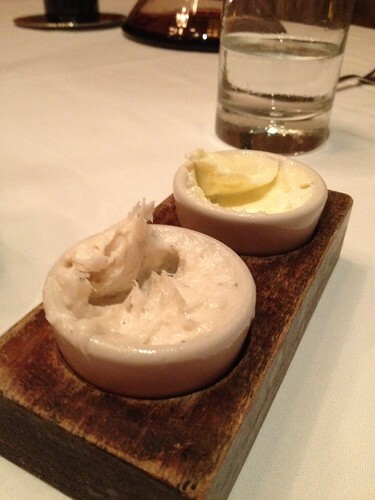 On the other was little more than a monument to excess, a duo of whipped butter and whipped lard. From pie crusts to fried chicken to carnitas, I’ve enjoyed lard in many forms but, as far as I can remember, this was the first time I have seen it served as an equal to butter. 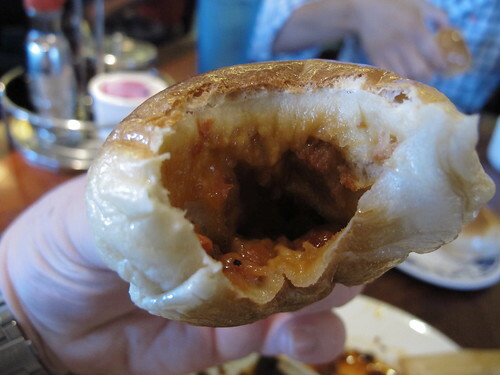 While it did melt beautifully in the hot roll and each bite was tinged with a delightful hint of pork, it was all too much of a good thing. In my mind, this sort of fat is best savored like lardo, served sparingly and used to provide a little silkiness for something like a charcuterie platter. In this instance it was simply lard for the sake of lard, and it was far too much. But that’s enough about pasta and lard, it was time for steaks to arrive, starting with a ribeye. 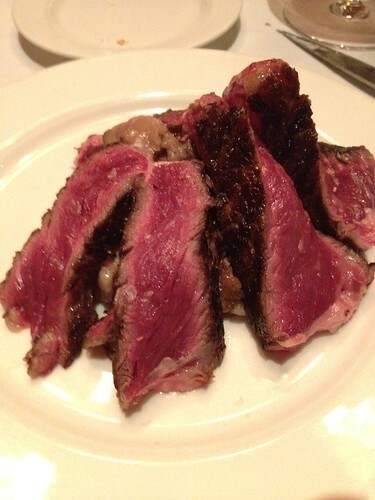 Having requested medium rare +, I was a little surprised to see that Carnevino took a more black and blue approach. Little matter as this dry aged steak was still deeply charred, a bit too salty, and lightly flavored with rosemary on the outside while the interior was tender and quite beefy. 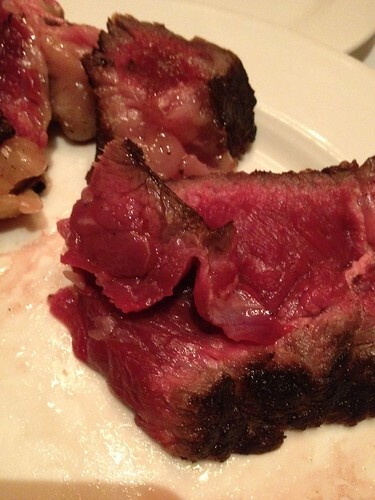 While there wasn’t much un-melted intramuscular fat, I would have preferred the steak to be a little closer to medium. 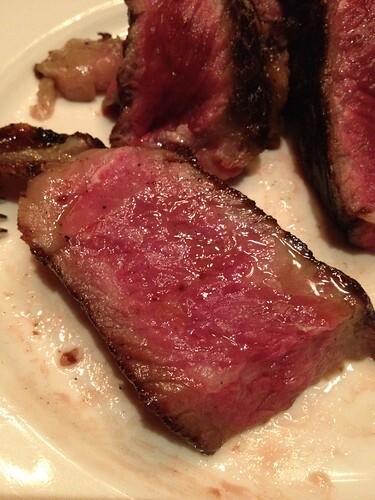 However the ribeye was an opening act to the main attraction, two inches of reserva sirloin. With the beef fat glistening in the light, it was plain to see that this was steak unlike any I had previously encountered. Large enough for everyone to have at least one piece, I was shocked at the initial flavor. Deep, salty, and a bit musty, it reminded me of mushrooms and a cross between salty genoa salami and a full flavored steak. Others in our party weren’t particularly impressed, with one comment about the reserva’s similarity to tar being quite memorable. Despite the reserva sirloin and the bit too rare ribeye, I would have called Carnevino an entirely too rich yet unique meal and be done with it, but that would leave so much unsaid. 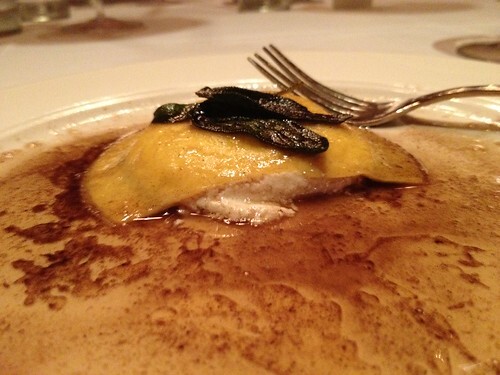 Although I rarely mention service in these write-ups, the waitstaff at Carnevino left much to be desired. Outside of a very accommodating sommelier, it was an evening of missing dishes, overcooked but quickly replaced steaks, and general inattentiveness. I understand that a waiter may not want to dote on a group of six guys, especially with the tip already built in from the group size, but I expected better from what some publications call the best steakhouse in Las Vegas. Sadly, I don’t make it to Vegas as often as I should but the next time I catch a Delta flight out west, I can be certain that dinner at Carnevino will not be on the itinerary.